Hello, I'm using Chrome in Windows on Kongregate, and I'm finally unable to play the game. There were troubles with the [Enable/Install Flash] button that sometimes didn't act when you clicked it, but after five or six tries it was fine. Today I needed to open/close/open the browser for about thirty times, until it finally realized that I clicked the button and launched the game. This was the last time I tried, I won't be dicking around another time. I already contacted Kongregate about this problem when it first emerged some months ago, but the chick in the tech support is a complete idiot, and she answered that I need to enable/install Flash, exactly the thing that I informed her that I'm unable to do, coz the button isn't working. When I tried to explain to her that I well know that I need to enable/install flash, but I'm unable to do so coz the button is not functioning, that nutwit told me to read the Kong discusion why I must enable/install flash. So either she's totally fvcked up in her mind, or maybe Kong doesn't want to acknowledge that there's some issue. However they might listen to you, the developer. Or not, if they're really that stupid as my communication tells. 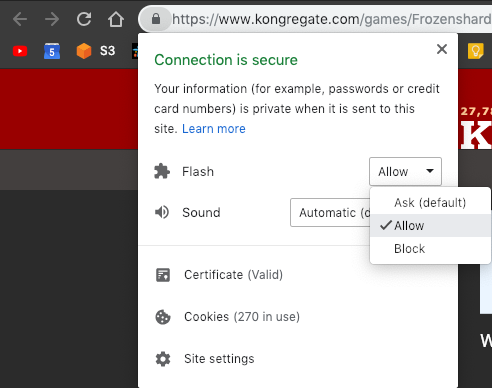 tl dr: Kongregate'S Enable Flash button doesn't work properly, and Kong doesn't give a dime. Try acting from the dev's side of fence. Hi Aine, thank you very much for the information about this, we will review this first thing in the morning and will contact Kongregate to get some more information about this. As soon as we get info back from them we will get back to you. We are still waiting for that extra information, in the meantime let me detail here a workaround that should work always, no matter which version of Chrome you are using. You should be able to click on the gray "lock" icon located on the left of the address bar where you type the url you want to go to. Then, choose: "Flash" -> "Allow" and click elsewhere on the game screen to prompt the blue "Reload" button that will refresh the page loading the Flash plugin properly. We know this isn't ideal, but Chrome is currently discouraging players to visit Flash sites and this is its way of doing it. Windows 10, Google Chrome 71.0.3578.98, and I'm unable to realize what version of Flash I own, coz it's so damned difficult, even the Flash site can't just test it write it. Oh, and thanks for the tip! No problem Aine, glad you sorted it out! Well, I hope it won't come back. So far it looks ok!